Developers can now reuse existing code to easily provide wallets for many more coins, with the Bitcoin and Altcoin Wallets FREE WordPress plugin. With the 2.2.0 release of the Bitcoin and Altcoin Wallets FREE WordPress plugin, developers can reuse existing code to easily provide more coin adapters. 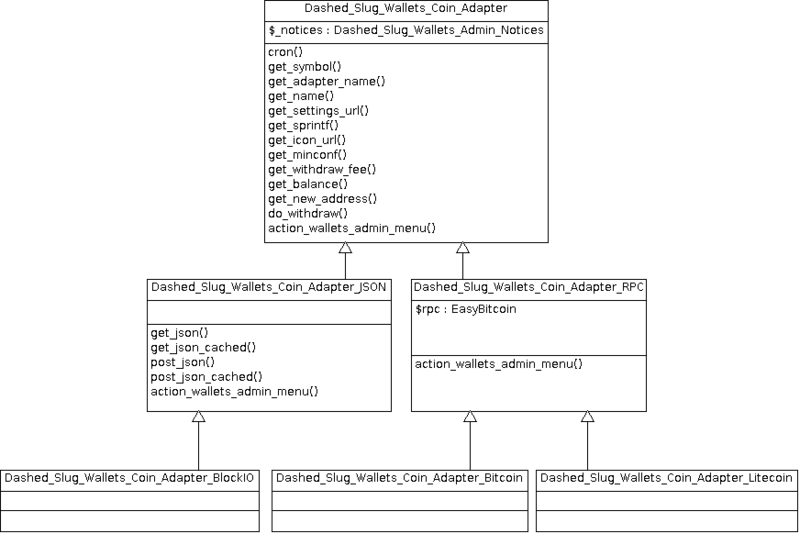 There was a major refactoring of the coin adapters API into a small OO-style class hierarchy. The API has been cleaned up enough to be stable. Simply extend from a base class and start integrating your wallet service into the Bitcoin and Altcoin Wallets plugin. If you need instructions on how to develop a wallet adapter for Bitcoin and Altcoin Wallets, there is now a section in the accompanying PDF manual. Just go to the downloads section and choose the bundle download. A number of bug fixes made it into this release as well. do you have any detailed instructions on how this or the Json or Php api’s work? I read go off of the litecoin and make changes as needed, but not really sure what changes to even look for, can you point out what we should be changing? or am i missing those instructions somewhere? You do not need to touch the PHP API or the JSON API if you’re trying to create a new coin adapter. Yes the steemit post is an old version of the manual. The latest version of the manual is always in the bundle download. I do not provide programming instructions on how to modify coin adapters, because if the modifications are not obvious then perhaps it’s not safe for you to develop a coin adapter. In any case, IF and ONLY IF your wallet is JSON-RPC compatible with Bitcoin core, then you should be OK if you modify the options that get set on plugin activation (and uninstall). Make sure to also modify any relevant text strings. If your wallet is not similar, then you will need a developer to do this. sorry but i am capable BUT knowing which files to look at to make the changes is what i am looking for. I do not want to go mucking around and messing up your code thinking it is something i am supposed to change. as far as the php and Json goes, that question is separate and i am trying to find some samples of them and how they work. again these questions are not about not being capable but some samples would save hours and hours of time, i would even pay for it if that was a option. Not know where to look to make changes is very tough, thanks for your help cant wait to get some of the plugins working once we get our coin working! You are correct in that I should provide more examples, I just haven’t found the time. I will make a note to do this. In the meantime the best example is to study the Litecoin adapter. The code isn’t very long, only a few screens. Do not start from the Bitcoin adapter, because it is built in to the plugin. Use the Litecoin adapter as a starting point instead. The name is defined in `get_name()` and the symbol is in `get_sprintf()`. Read the phpDoc comments in the file `wp-content/plugins/wallets/includes/coin-adapter.php` for details.